Multnomah County Chair Deborah Kafoury (left), Commissioner Loretta Smith (right), and Central City Concern staff members John Karp-Evans, Elissa Black and Freda Ceaser gather to announce a program called ‘Flip the Script’ to end the cycle of incarceration and homelessness for African-Americans in the justice system. 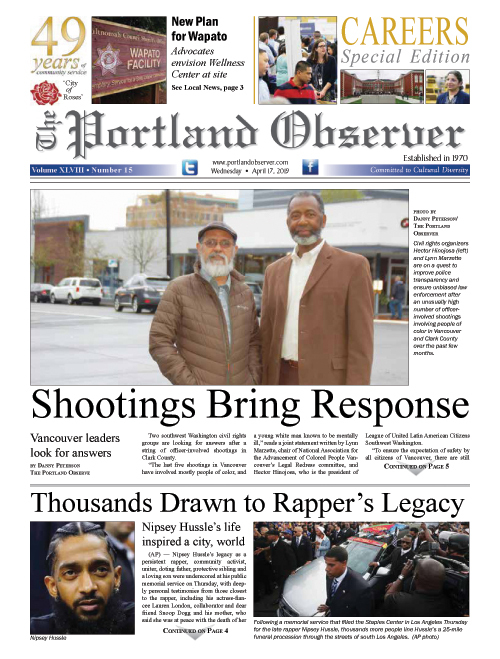 Local African Americans exiting the criminal justice system will have more support to succeed thanks to a new ‘Flip the Script” program that provides comprehensive solutions to ending Portland’s homelessness. Central City Concern, a Portland nonprofit, and Multnomah County, recently announced a partnership to end a cycle of incarceration in the community. "We assessed our outcomes and learned African Americans exiting from a criminal justice program without employment or housing had a 36 percent chance of re-entering the system," said Freda Ceaser, employment access program manager for Central City Concern. “We'd like to lower that number." Flip the Script will provide housing, cultural peer support and an employment specialist to support reentry into the community. “These are key things people need to engage back into the community. I'm hoping Flip the Script will impact the system in an authentic way," says Ceaser. The program should serve about 150 people in the next year. Central City Concern is partnering with the county’s Department of Criminal Justice to identify and support candidates for the program. "We know that a stable home and steady work are the foundation for a successful life," says Multnomah County Chair Deborah Kafoury. "For too long, our criminal justice system has focused on punishing people, especially people of color, instead of investing in their success. This collaboration will change lives." For more information, visit centralcityconcern.org or visit multco.us/dcj.